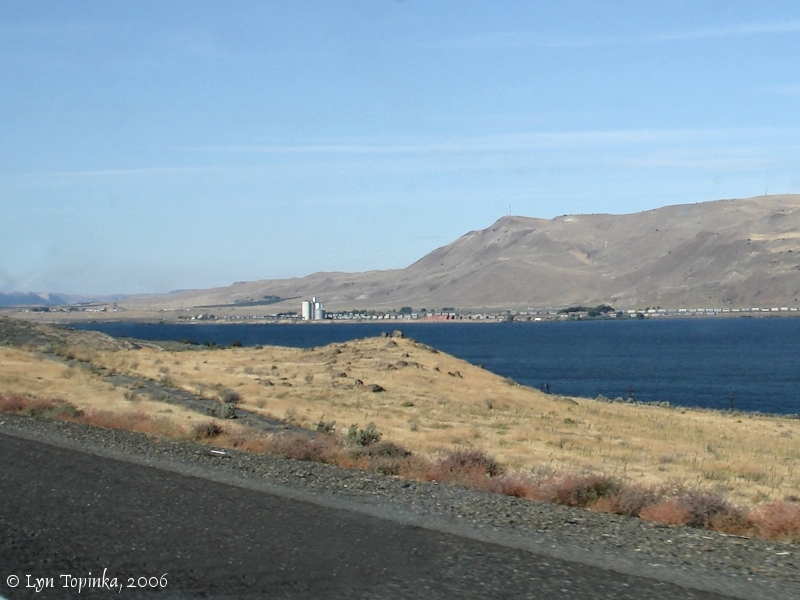 Click image to enlarge Roosevelt, Washington, from Interstate 84, Oregon. Image taken October 2, 2006. 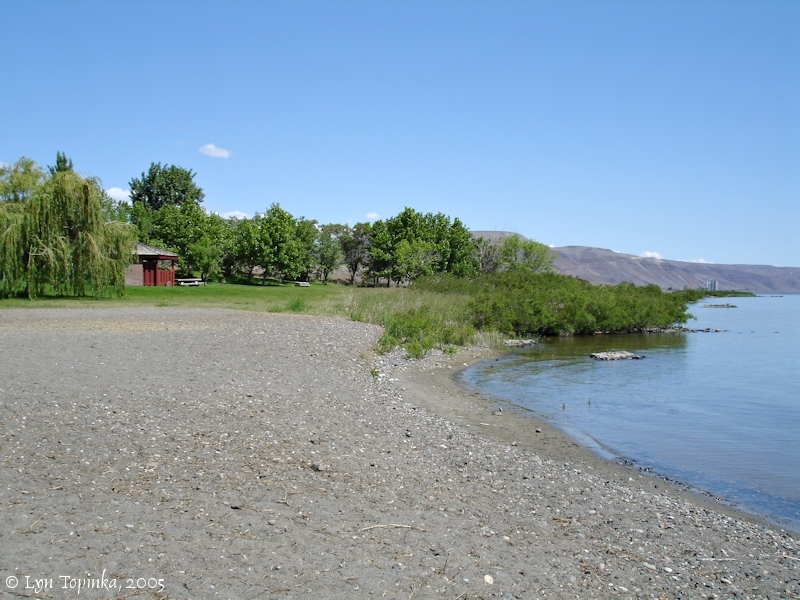 Roosevelt, Washington, is located in Klickitat County on the Washington banks of the Columbia River at River Mile (RM) 244.5. Five miles downstream is the orchard community of Sundale and 45 miles upstream is the community of Plymouth. On the Oregon side directly across from Roosevelt is the community of Arlington. Roosevelt was named by T.B. Montgomery to honor Theodore Roosevelt, the 26th president of the United States. According to Robert Hitchman in "Place Names of Washington" (1985, Washington State Historical Society), "Montgomery built stores, hotels and other structures, which he offered rent-free for one year to tenants". 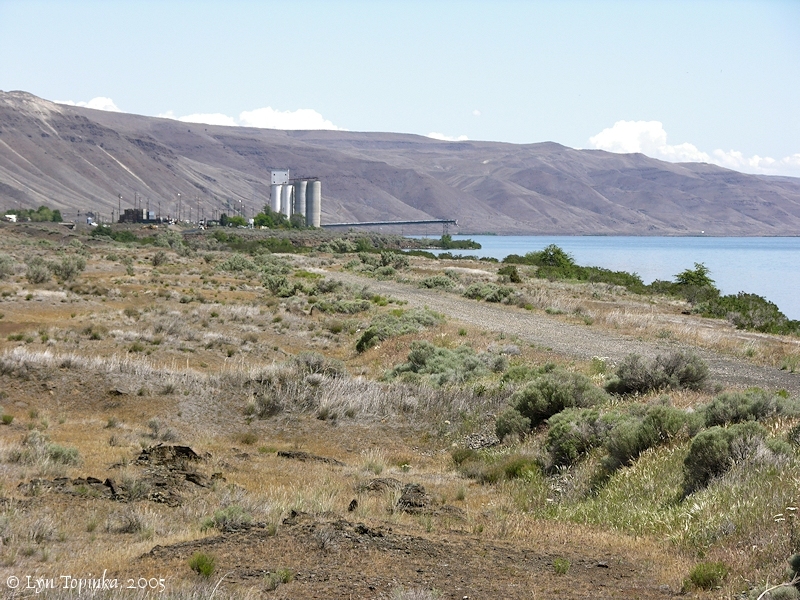 "Roosevelt, Wash., is the creature of the building of the North Bank railroad down the Columbia River. The first settlers at this place located here in 1906, and were T.B. Montgomery and J.A. Foister. Mr. Montgomery laid out the town, built the Roosevelt Hotel, and secured a postoffice here, of which O.B. Ebi was the first postmaster. Mr. Foister built the schoolhouse here and purchased that hotel from M. Montgomery, and opened it in 1906. The place has a hotel, two general stores, three grain warehouses, blacksmith shop, lumber yard, paint store, barber shop, and livery, operating along with the livery business the stage line for mail, passengers, and express between this place and Bickleton. Roosevelt has ferry connections with Arlington, Ore., giving the people of this side of the river the privilege of transportation over the O.R. & N. railroad. The ferry is run by steam and a very commendable service is maintained throughout the day. Roosevelt is the rail and river shipping point for a very large and rich country devoted to wheat, cattle, sheep, and some fruit. In the locations where irrigation is possible some of the finest specimens of fruit have been raised that have ever sought an exhibition table. In its very beginning Roosevelt is promising and prosperous, and as the development of the country tributary to it is continued it is bound to grow and become important. " Source: "Bickleton News", November 25, 1910, courtesy J. Elmer, "rootsweb.com" website, 2015. 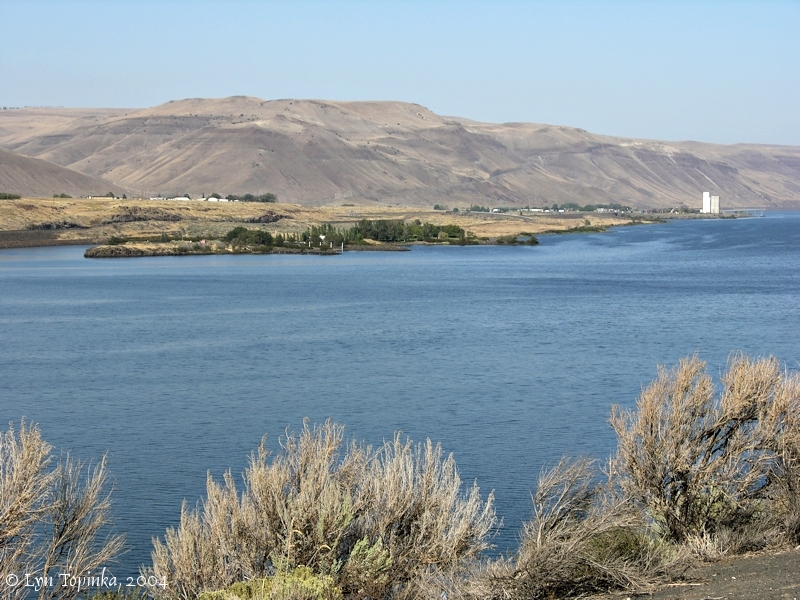 Lewis and Clark camped twice near Roosevelt. 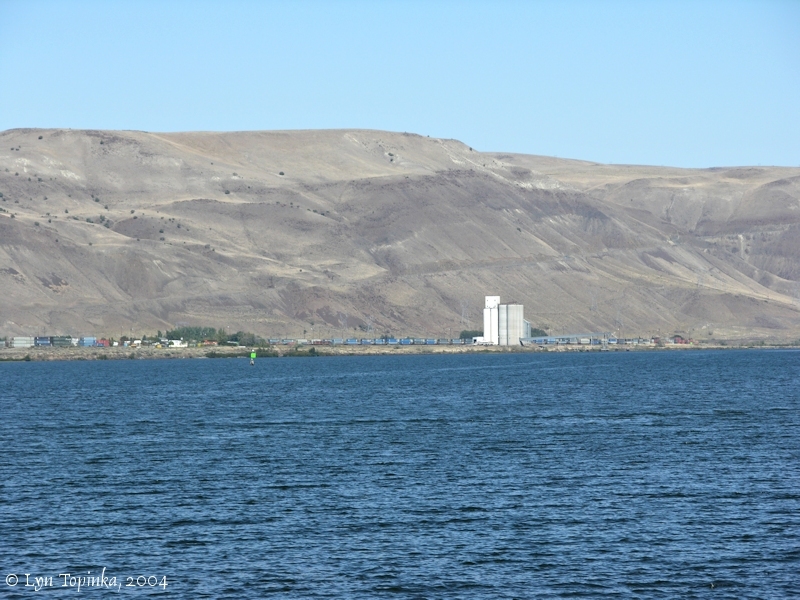 On the night of October 20, 1805, the Corps camped upstream of Roosevelt, in the vicinity of today's grain elevator. On the night of April 24, 1806, their camp was two miles below their campsite of October 20, 1805. Today this would be at the eastern edge of Roosevelt, west of the Grain Elevator, and nearly across from Arlington, Oregon. On the route map (Moulton, vol.1, map#76), Lewis and Clark's camp of October 20, 1805, is marked on the north bank of the Columbia just downstream of many islands in the river (in the vicinity of Willow Creek) and upstream of a marked village of 5 lodges, at the upstream tip a narrow strip below the high banks of the Columbia. Today this would be upstream of the community of Roosevelt, in the vicinity of the Grain Elevator. 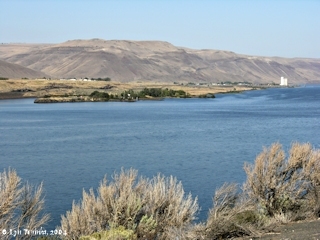 Lewis and Clark's previous campsite was located on the Oregon side near Irrigon, Oregon. 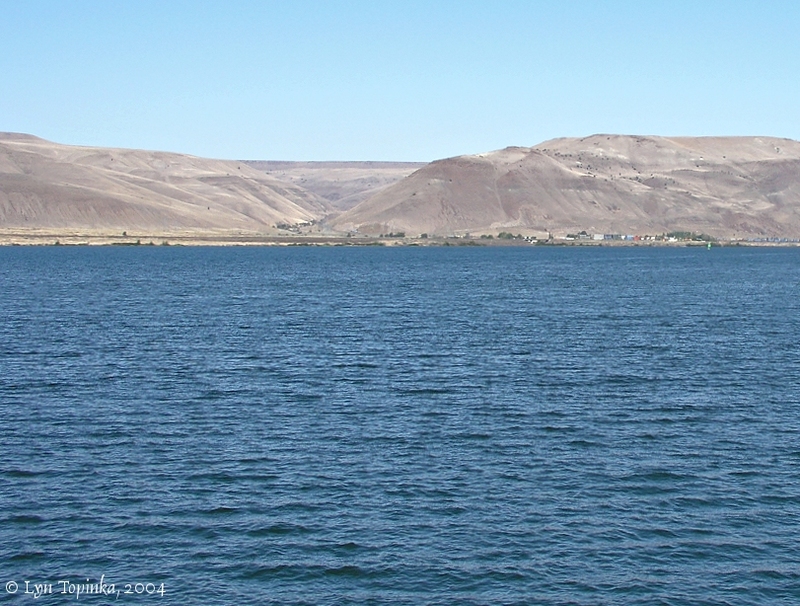 Their camp of October 21, 1805, was downstream of today's John Day Dam. 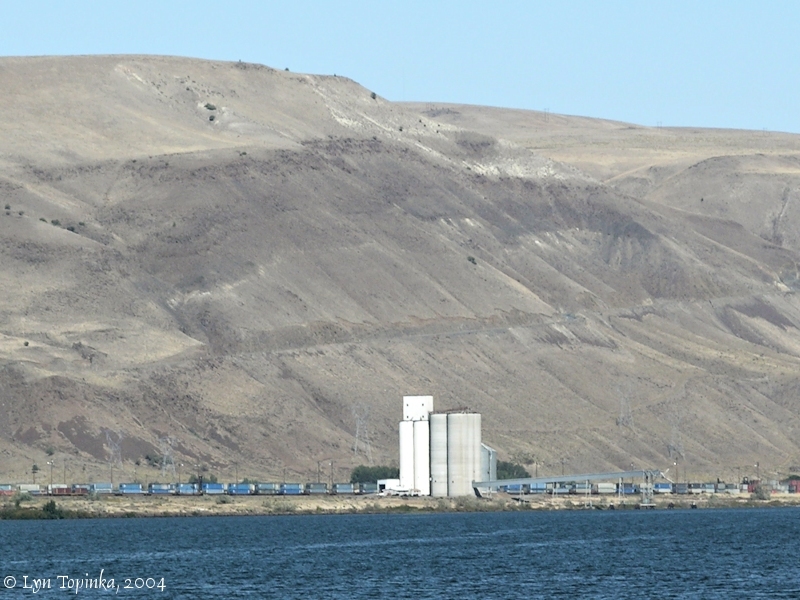 Click image to enlarge Roosevelt grain elevator as seen from Arlington, Oregon. Image taken September 24, 2004. Click image to enlarge Roosevelt, Washington, as seen from Arlington, Oregon. Image taken September 24, 2004. According to Captain Lewis's entry, the campsite of April 24, 1806, was two miles below their campsite of October 20, 1805. 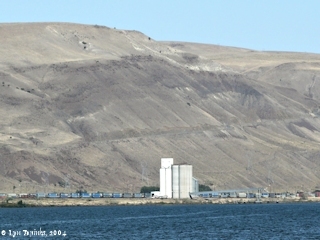 Today this would be at the eastern edge of Roosevelt, west (downstream) of the Grain Elevator, and nearly across from Arlington, Oregon. The route map (Moulton, vol.1, map#77) shows the camp near a village of five lodges. Lewis and Clark's previous camp was located upstream from the mouth of Rock Creek, Washington, and their camp of April 25, 1806, was near Alder Creek, Washington. 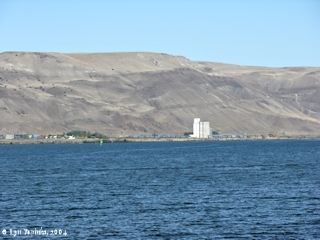 Click image to enlarge Grain Elevator, Roosevelt, Washington, as seen from the west, near Lewis and Clark's campsite of April 24, 1806. Image taken May 24, 2005. Roosevelt Park is a U.S. Army Corps of Engineers park located on the west side of the town of Roosevelt, Washington. The Washington side of the Arlington-Roosevelt Ferry was located at Roosevelt Park. A ferry once connected Arlington, Oregon with Roosevelt, Washington. The Washington side of the ferry was located at today's Roosevelt Park. "... The Arlington Ferry (cars, $1 ; round trip, $1.50) makes connections with Roosevelt, Wash. ..."
Click image to enlarge Roosevelt Park, Roosevelt, Washington. Image taken May 24, 2005. 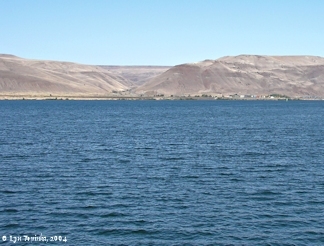 Click image to enlarge Roosevelt Park, once the location of the Arlington-Roosevelt Ferry, as seen from downstream Arlington, Oregon. 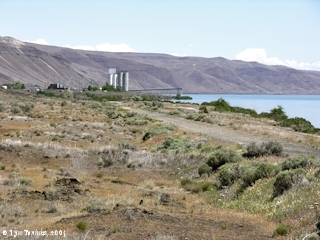 The Washington side of the Arlington-Roosevelt Ferry across the Columbia River was located at Roosevelt Park. Image taken September 26, 2004. Wood Gulch is a narrow canyon which rises through the hills above Roosevelt, Washington. Wood Creek, a perennial stream, runs through Wood Gulch. Click image to enlarge Wood Gulch, Roosevelt, Washington, as seen from downstream Arlington, Oregon. Roosevelt lies to the west (left), out of the picture, while North Roosevelt is visible on the right. Image taken September 24, 2004. 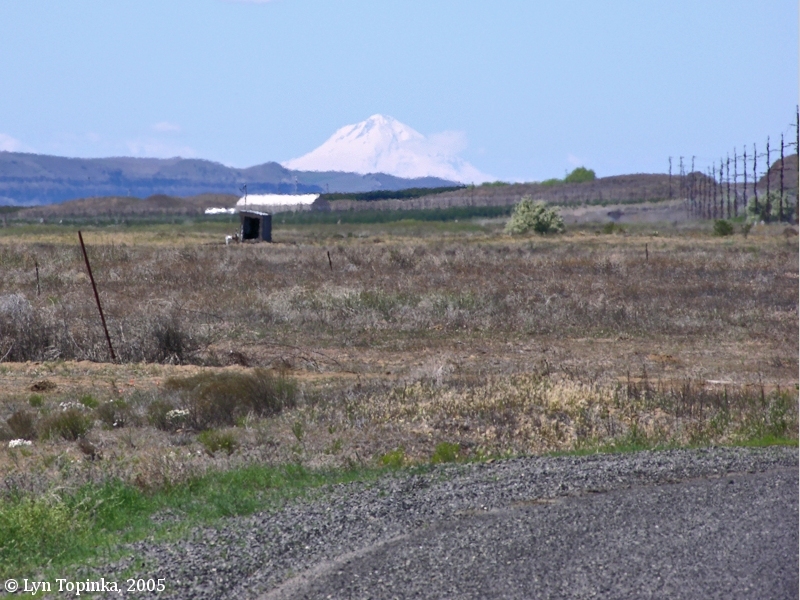 Mount Hood, Oregon, one of the Cascade Range Volcanoes can be seen from Roosevelt, Washington. 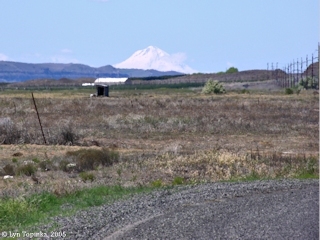 Click image to enlarge Mount Hood, Oregon, as seen from Roosevelt, Washington. View taken from west of town. Image taken May 24, 2005.
a clear frosty morning. we Set out eairly. proceeded on passed a pleasant part of the County level Smooth plains but no timber. the River Smooth. we Saw Some pilicans and abundance of ravens and crows, as the Shores are lined with dead Sammon. about 12 oClock we halted at a village to dine where we bought a fiew roots &C. and Saw among them a number of articles which came from white people. Such as copper kittles Scarlet &C. passed many rapid places of water. the country continues as yesterday our hunters who went in the small canoe killed nine ducks and a goose to day. we came 46 miles this day. and Camped on the Starbord Side [near Roosevelt, Washington] no wood except a fiew Small willows.